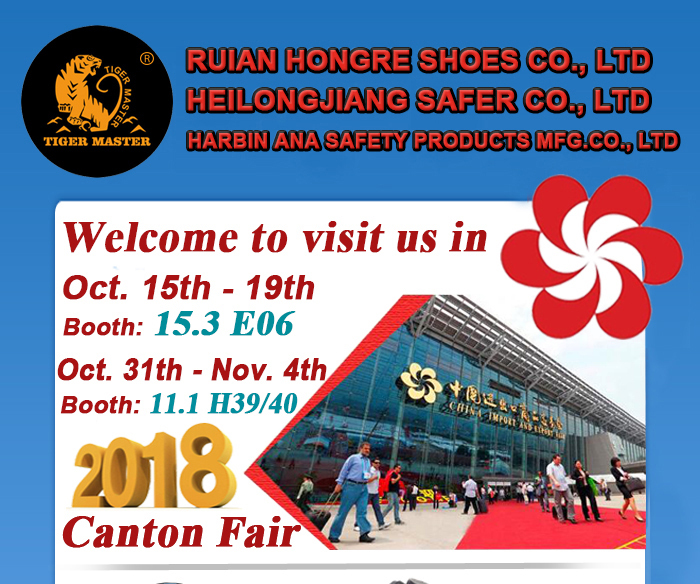 Welcome to visit us in 2018 China Canton Fair - Heilongjiang Safer Co., Ltd.
Fair is divided into three phases. Phase 1 focuses on electrical and electronic products, building Materials, industrial products. Phase 2 focuses on such labor-intensive products as groceries, ornaments, gifts, and furniture. Phase 3 focuses on clothing, footwear, bags... and food medicine that such as use on people. 2018 Autumn Canton Fair is coming soon and our company will attend phase 1 and phase 3. We are safety shoes and rain boots factory in china. In the exbihition, we will show our newest safety shoes and rain boots for buyers from all over the world.